These pages will provide you with the most important information about the start of your program in order to make the initial phases of your degree as stress-free as possible. During the semester break and prior to lectures, first-year students (Bachelor and Master students) have the opportunity to attend important introductory courses. 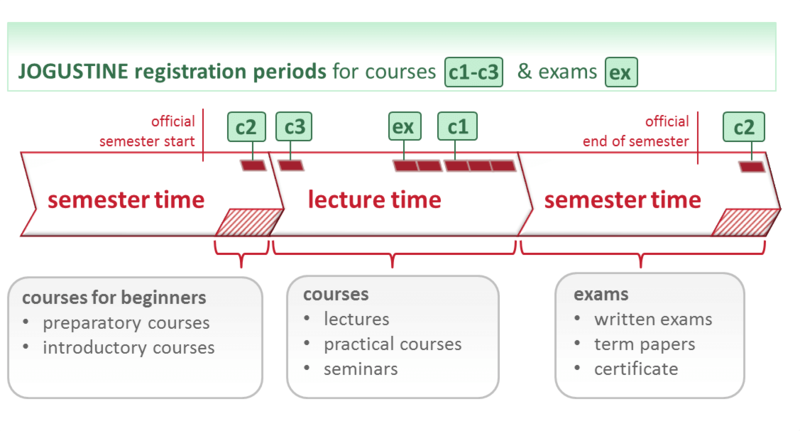 During this period (c2), you can also sign up for courses and complete your schedule in time for the first week of lectures. Any necessary changes can still be made during the first week (c3). Exam registration takes place later on during the lecture period (ex), prior to course registration for the following semester (c1). In order to help you plan your degree, study schedules are available that provide you with an example of how to structure your program. You can access the various study schedules for the corresponding degree programs in the description of each degree program. It is not compulsory that you follow these schedules. Depending on aspects such as background knowledge, abilities and time restriction, it is often not possible to stick to these schedules. In theory, this is not a problem but it may possibly result in delays to your degree. If you have any questions that you can't find in our FAQs please don't hesitate to contact our Departmental Advisory Services.